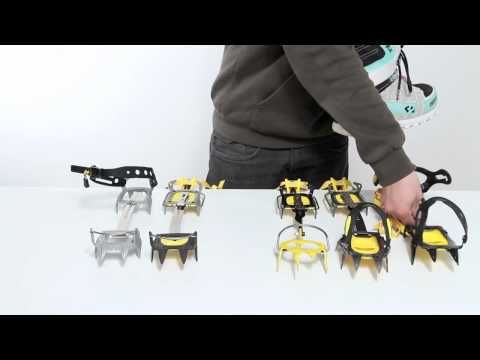 These light alloy crampons are suited to easy climbs and glacier traverses. They will also perform suitably for ski touring and technical alpinism. Aluminum is not as durable as steel for travel over rock and hard ice, so these will be best where hard snow is more likely to be encountered. 10-point design with 2 front points. Semi-rigid design is compatible with most rigid sole mountaineering boots. Single strap system adjusts to fit most footwear types, including those without heel and toe welts. Fits European boot sizes 36 – 47.